Monday, June 28 we left Dubois and headed for Yellowstone. 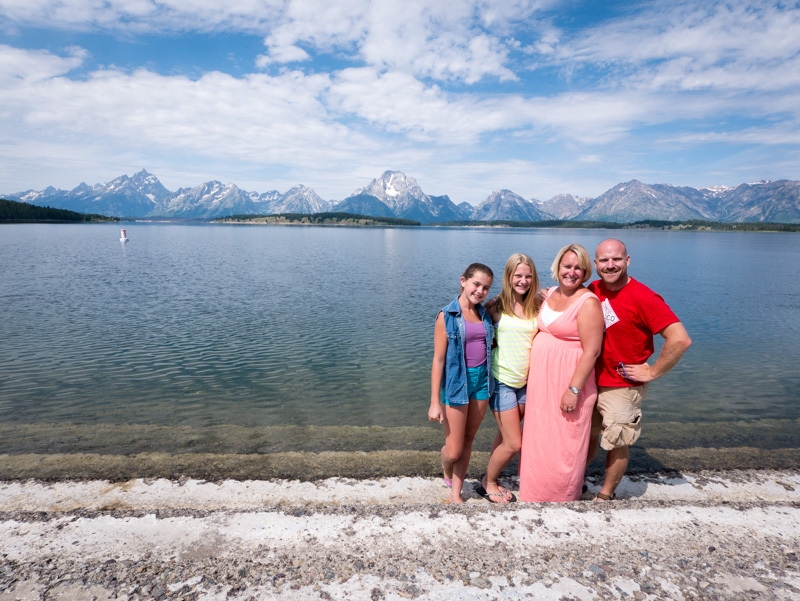 Along the way we stopped at the Jackson Lake Dam for pictures with the Tetons. As we entered Yellowstone National Park we picked up three hitch hikers. They were students from Georgia who had dropped off their car at the south end of the park and needed a ride north so they could do a 70 mile hike back down to their car. It was fun to talk to them and help them out. Tessa thought two of them were cute. This was Tessa's first visit to Yellowstone, and since we were driving past Old Faithful we stopped to see it blow. You should have seen the parking lot for this joint. Like Disneyland! We were still in transit to our campground, however, the RV pulling the Jeep, and that's no way to visit Yellowstone. So we plowed on to the RV park and hung out there for evening. The next day, Tuesday July 29, was the day we set aside to see more of the park. Yellowstone is way too big to appreciate in a day, we know that, so we focused on the northern loop that we have not done on previous trips. Even that is too much to see in a day, but as this trip winds down we are anxious to get home. We tried to get an early start to see some wildlife. Then we found ourselves driving up a dirt road towards the north end of the Mt. Washburn trail. We continued on foot for a while, but Sarah Michael took some convincing. Jessie and Tessa were much more game for the activity. We weren't even trying to make it all the way up to the fire lookout, we were just aiming for some snow. I was a nice Dad and carried Sarah Michael the last few yards to the snow field. It was a small gesture but it made her smile and stop complaining. ...and a bear! 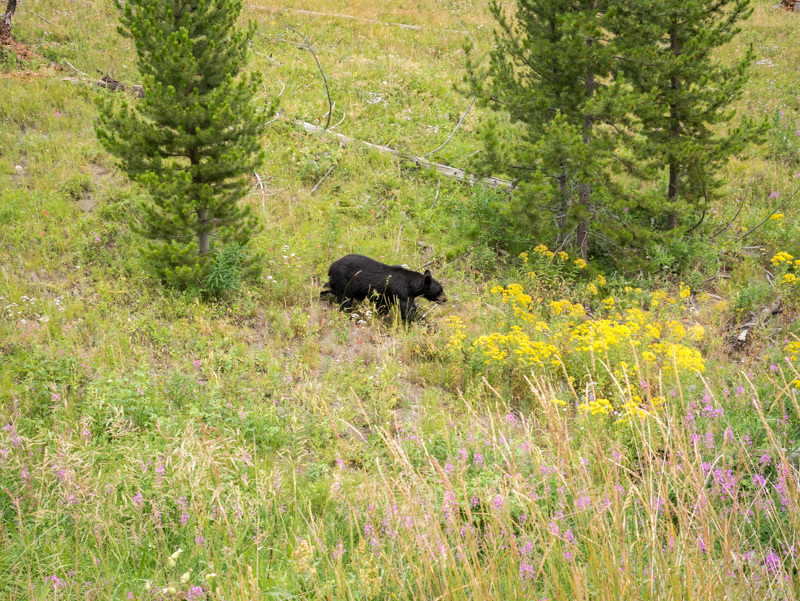 Actually we saw two Black Bears. The first was pretty near the main road but bush-obscured and tough to get a decent view of. This second one we encountered along the Blacktail Plateau Drive. 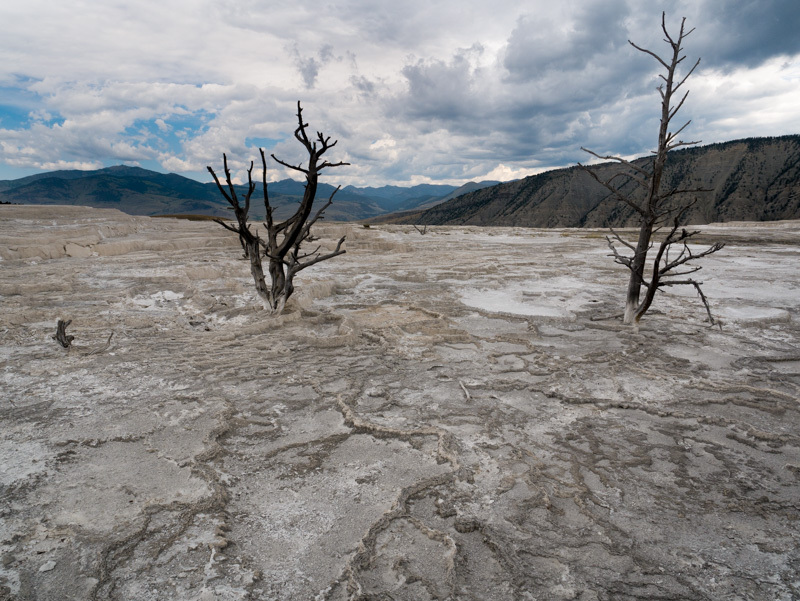 We visited Mammoth Hot Springs. It is beautiful. It has a lot of dried-up-ness though. It isn't as watery-flowy as what we saw in Thermopolis. But it has some stunning features. As we prepared to leave I saw this older gentleman holding up his iPad like he was taking pictures, but the WiPry antenna hanging off the side got me curious. I looked closer and saw not an image of the hot springs like from a camera, but rather something like a graph. I had to know more so I asked him what he was doing. He told me about the electronic radiation emanating from smart power meters that transmit data back and forth. He can pick up these signals way up here. This guy and I talked for a good long time. Part of me wished I had my camera and microphone to capture the knowledge he was dropping, but the other part of me wasn't that interested. At his urging I did write down a couple notes. First, look up LESSEMF. Also learn about dirty electricity. This guy was great. I'm so glad Jessie thought to take the picture of me with him. Then we hiked a couple of easy loops to see geyers and springs and paint pots. As the hour latered, the weather worsened. The geyser areas are way-cooler in person. There are sounds and smells and you can feel the heat and the weight of the steam pass you. It is neat. This was right near the Constant Geyser, which was not constantly geysering, or erupting or whatever. We caught it on a break. It rained some while we hiked but it really let loose when we were in the car. We even got into some light hail. So we got out to dance in it. Here's a tip: You may think about leaving the park at the end the day, at dinner time. You may be one of thousands of people thinking the very same thing. And many of you will be leaving out on the same single-lane exit road for 14 miles. We are nearly done. We will leave in the morning for a few days of driving to get us home by the end of the week!